CASCADE, Mont. – Many will remember Adam Clymer, who passed away Monday morning, as a dogged New York Times senior reporter or as a young reporter in 1972 covering his first presidential campaign in Timothy Crouse’s Boys on the Bus. Tributes will be paid to his journalistic accomplishments, which were many. But those of us who really knew him will remember him as a friend who, above all, embodied Winston Churchill’s advice to never, ever give up. We became friends of a sort when he was covering politics not for the New York Times, but for the Baltimore Sun. But it wasn’t until some years later that he called me to say he had had a back operation and was anxious to get back on a stream for fly fishing, but wasn’t sure if it was safe to fish alone in his condition. He needed someone to accompany him, and he had found out that I too was addicted to fly fishing. I quickly accepted his invitation into the coterie of Clymer fishing companions. We always looked forward to wetting a line with him. Marty Tolchin, who worked at the New York Times with Adam once called him “an acquired taste,” but once acquired, a friend one could count on. He was opinionated as am I, but never let politics or work interfere with his enjoyment of the opportunity to fish with friends of whatever persuasion. I could count on him to spend a few days or a week with me in Montana every summer, wading and later floating that magical state’s trout rivers, streams, and creeks. It became harder for him as the years went on. He had an ankle operation that precluded wading and he suffered from Parkinson’s, which made it difficult for him to tie on a fly or, last year, react in time to set the hook when a fish struck. But he never complained and was always happy on the water. A few years ago, Adam on his own signed up to float the Smith River, perhaps the state’s most beautiful. Fishing it requires a three-day commitment and a willingness to rough it, as once one puts in there is no turning back. After the float, he called a mutual friend in Great Falls to join him for a steak dinner to celebrate crossing yet another item from his angling bucket list. As Adam caught his plane back to Washington, my friend turned to me and said, “It takes determination and real guts for anyone at his age and condition to do what he did. I’m ready to help him regardless of his condition.” I agreed, and we did. Adam got the front seat in our boat from then on, and we helped him with his walker as his health deteriorated. Former Chicago Tribune reporter Jon Margolis had worked and fished with Adam and joined us in Montana whenever possible. Jon says that it was Adam’s determination and refusal to give up or complain that made him a great reporter as well as a superb angling companion. We didn’t get to fish together this year. I had emailed Adam my dates in Montana so that we could coordinate our schedules. He called to say he hoped I would be willing to accommodate his unpredictable schedule, because he had just been informed that he had pancreatic cancer. He suspected his prescribed regimen of treatment would disrupt any plans to get out west and fish. I said we would make it work, but we never did. Before going into the hospital for treatment, Adam snuck out to Montana on his own for one final day on the water. He didn’t want to be a burden and, I expect, he wanted one day in solitary contemplation of his life while doing what he loved. The day after learning of his passing, I floated Montana’s Missouri River. I took a minute to drop anchor and call Margolis, who informed me that while he rarely drinks at lunch he had just ordered a martini in Adam’s honor. I told him where I was and that today’s float was also being made in his honor. Neither of us could think of a better way to remember a good friend and companion. When a fly fisher signs off, he does so with a traditional closing: “Tight Lines,” Adam! 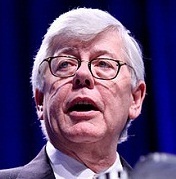 David Keene is former president of the National Rifle Association, former chairman of the American Conservative Union, and a former managing associate at the Carmen Group.